Is it possible to install or import the Affinity Photo styles that I downloaded from the Internet? I’m working on an iPad Pro, iOS 11. Welcome to the Serif Affinity Forums, @bkabstract. 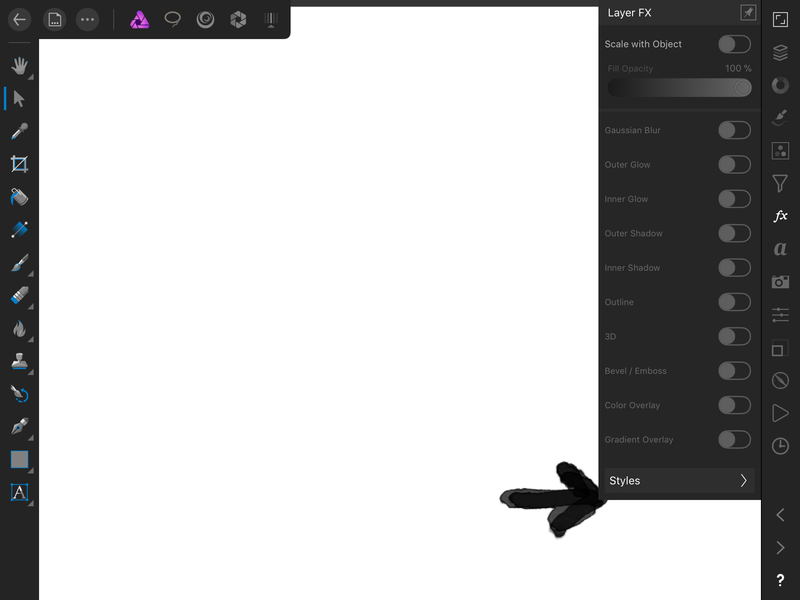 Affinity Photo doesn't understand the Adobe Photoshop layer styles (*.asl) format, if that's what you're asking. BTW, you might want to remove your email address from your post to this public forum. It's only going to attract spammers and scammers. I actually meant the "styles" at the bottom of the text (layer) "fx" dropdown window on right side of screen. I want my new 300 styles to show up there. Those are customizable. Or is that a desktop only feature? Thanks! Thanks for rewording your OP and clarifying your question. As for advising you further, I'll leave that to someone who knows the answer! Choose a Styles category to save the style into. Select the object whose style you want to save, tap Preferences on the Layer FX Studio, then choose Add Style from Selection from the menu. That’s going to be tedious with 300 styles involved! 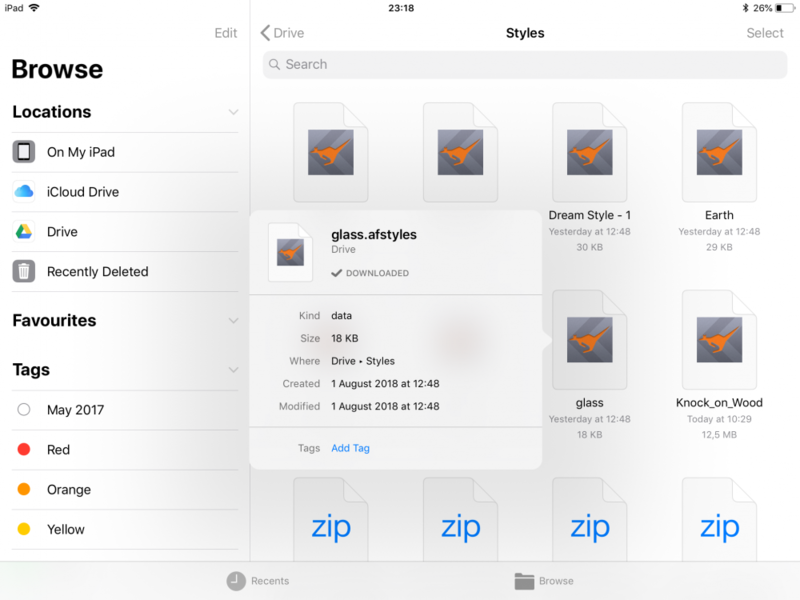 Open the FX Studio, tap the Styles button on the bottom, tap the small menu icon on the top right (near the pin icon) and select Import Styles then select the .afstyles file from iCloud or other cloud service you might be using. Is the 'import styles' option only available on the current beta? I have it now, but couldn’t find it the the General release 1.65 version. Yes, currently it's only available in the Beta. I should have added that. It will be included in the next retail update. As I wait for my Beta request to be filled , When is the expected retail release? Soon I hope. The beta has a very annoying bug associated with brush colour picker rendering it very hard to use. The beta does have much improved iOS Files integration though and a few other features/fixes. All in all, the developers are doing a great job with AP for iPad. It’s an amazing app. What is Beta? As for me when I chose the import function it opens the drive but doesn’t read my afstyles nor brushes. How can I get styles and brushes on my iPaad AD? The beta is a test version, released to a group of testers so that bugs and poor functionality can be fixed before general release. What storage are you trying to read your styles and brushes from? It should be 1.6.8.77. If it is not, open the App Store application on your iPad & tap the "Updates" button at the bottom of the screen & install the update from there. Sorry for the confusion. If you are using Affinity Designer then that is the current version. But importing styles into the FX Studio > Styles panel should work from at least iCloud Drive -- I just tried it here & it works fine. 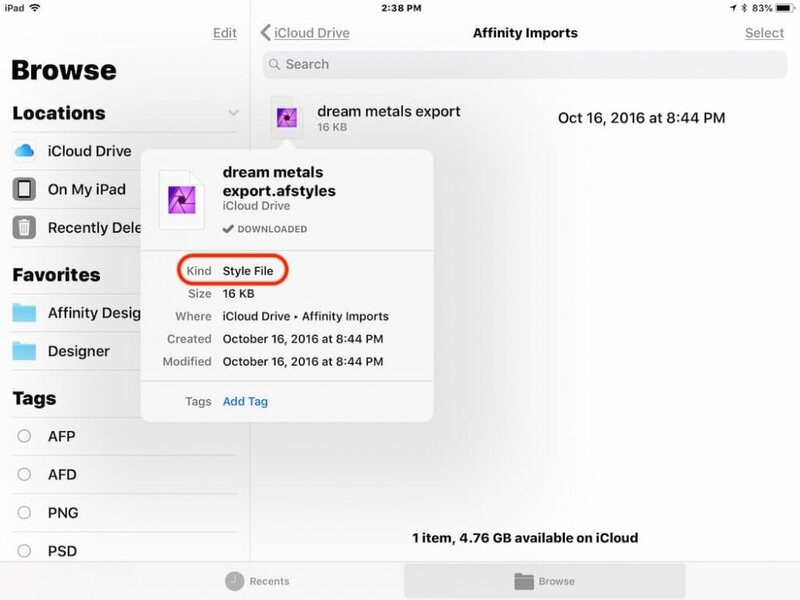 Are you sure the file you stored to your iCloud drive has the afstyles extension? @R C-R Yes am sure. Can you give me. Any link to download from and try?? See the attached image. All styles are shaded and I can’t pick any. As discussed here, there sometimes seem to be file association problems when using Google Drive. There shouldn’t be any icons on the file thumbnails. Please post a screenshot of your iCloud Drive folder. 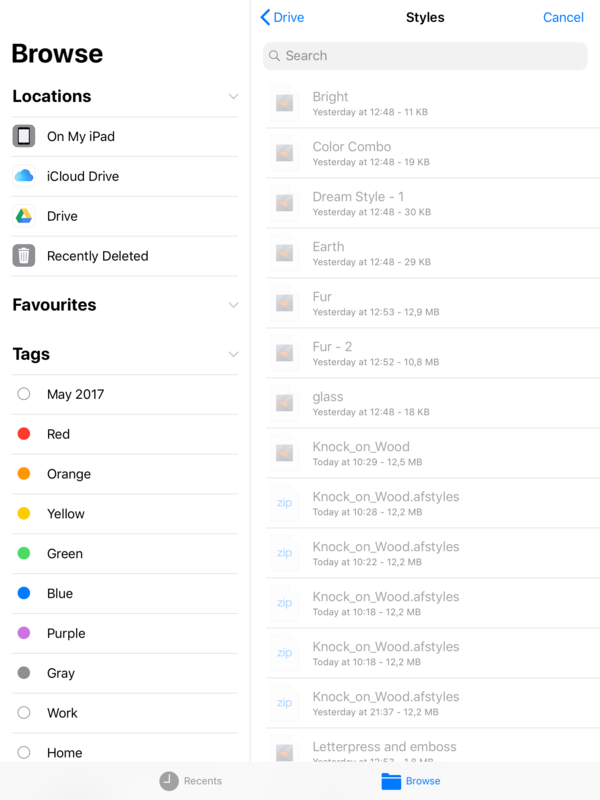 In the Files app (not AD) navigate to that same Drive folder. Long press on any one of the files listed there. In the context menu that pops up up, choose "Info," the last item on the right. 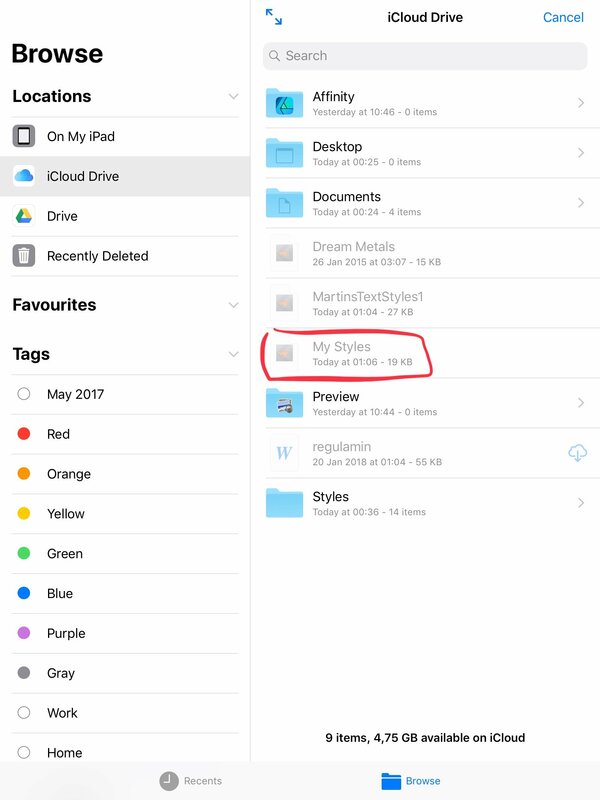 Does that show that the file has an .afstyles extension? If not, try uploading the file from the original source to your iCloud Drive & try the same thing. Does it show the extension there? If so, try importing it into AD from that source instead. Yes it has. I attached. I see that, but what it does not have is "Kind: Style File" like in this screenshot of an afstyles file I saved to a folder on my iCloud Drive. As @αℓƒяє∂ suggested, this may be a problem with file associations when using Google Drive as the cloud source. 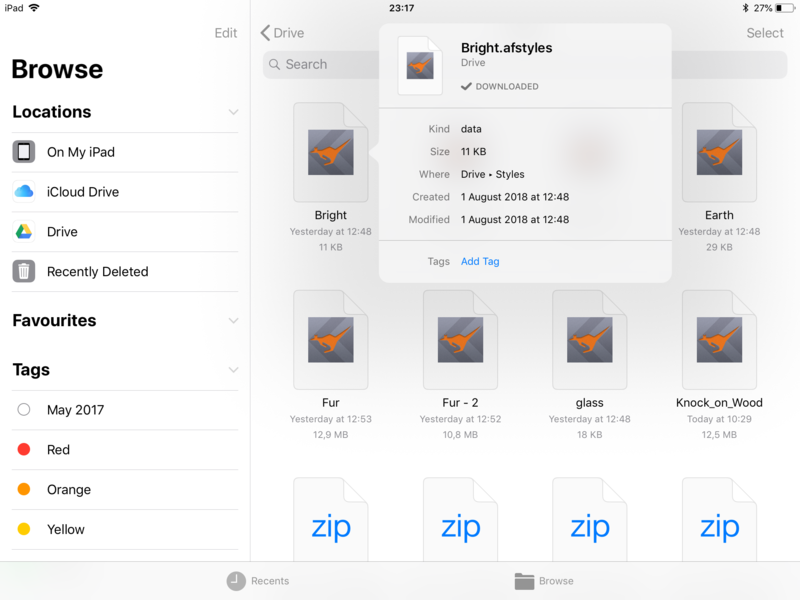 So maybe try copying the original file (not the one on Google Drive) to one of your iCloud Drive folders & see if it works from there. No matter if I get from my laptop or download it from a link on iCloud. Still the kind is or Data or Document. I don’t get it!! !